2005 FORD MUSTANG PREMIUM GT WITH A CUSTOM TURBOCHARGED 4.6L 3V BUILT V8.. ONLY 59K MILES ON THE CAR!! GARRETT M24 AR81 TURBOCHARGER SET TO MAX 10 PSI... EVEN AT THIS LOW SETTING, THIS CAR IS A MONSTER... WHEN THIS TURBO GETS GOING, YOU WOULD THINK YOU ARE LAUNCHING INTO SPACE... COMES WITH THE NITTO 555R DRAG RADIAL TIRES TO GET THE POWER TO THE GROUND... THE CAR RUNS GREAT! 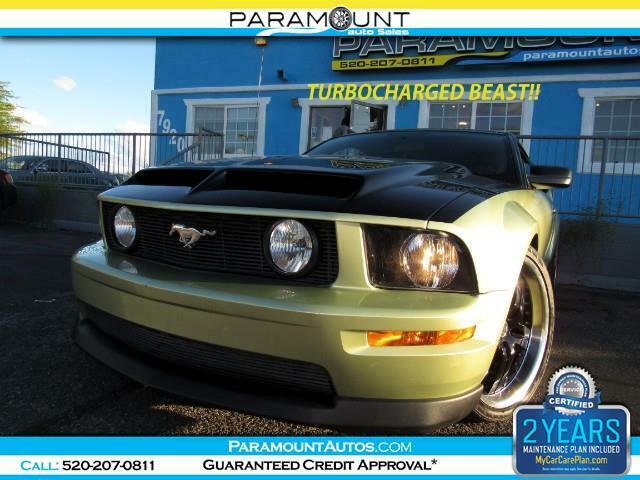 VERY EXHILIRATING, AND STILL THERE IS PLENTY MORE POWER LEFT IN IT... WE HAVE THE BEST SELECTION OF MODIFIED MUSTANG IN SOUTHER AZ, AND THIS LOW MILE TURBOCHARGED GREEN MONSTER IS NO EXCEPTION... WE ALSO HAVE SUPERCHARGED AND BOLT ON MUSTANGS AVAILABLE, BUT AT SUCH LOW MILES, AND WITH THIS MANY UPGRADES, THIS ONE SHOULD GO FAST SO DON'T WAIT TILL ITS GONE! CALL FOR MORE DETAILS.. FINANCING AVAILABLE!